Named after the patron saint of Glasgow, this flavourful golden lager has soft herbed butter and hoppy aromas. Full-bodied and creamy, vanilla and citrus tones follow through to a long, peppery, herbal finish with a good bitter bite. Pair with smoked salmon and cream cheese blinis or marinated green olives. Pure heavenly lager. Brewed in accordance with the German purity law of 1516. 138 calories per serving. 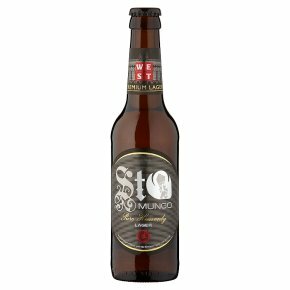 Vegetarian and vegan-friendly.West St. Mungo lager is brewed in strict adherence with the German Purity Law, the oldest food law in the world. West has selected only the finest German malt and the most noble hops, to create a deceptively easy drinking, light golden lager. Brewed in honour of Glasgow's patron saint and fellow brewer, St. Mungo premium lager is naturally carbonated and can be enjoyed on its own, or equally well with food. Best when served chilled... to induce that full heavenly pleasure.